To start off with, sorry if you’re not Armenian and are getting this email by mistake, I’m trying to guess based off of names! My name is Armand Kizirian, and I’m a 2L here at UCLA. I wanted to reach out to you guys at the start of 1L, basically to offer any help or advice I can in the challenging experience that is the first year of law school. Just moments before, I was contemplating dropping out. Then Armand, a person I’ve never met, reached out to me and offered support, because we share an “ian.” It was very encouraging. Soon, other Armenian upperclassmen began offering advice, outlines, and beer. I’ve heard similar stories from other Armenian law students. In honor of Armand and all the other helpful upperclassmen, I wrote this article to chronicle the formation of the Armenian Law Students Association (“ALSA”), the primary means by which Armenian law students help other Armenian law students. What is the Armenian Law Student Association? ALSA is a student group found on some law school campuses across the United States. Unlike the Armenian Student Association (“ASA”), whose activities are coordinated by the All-Armenian Student Association, ALSA has no central leadership. As a result, ALSA chapters are formed independently and lack a uniform name, logo, and mission. ALSA is the most common name for the Armenian student group on law school campuses, but it’s not the only one. Some law schools have an Armenian Law Society (e.g. University of La Verne College of Law), while others have an Armenian Law Student Society (Whittier Law School). For purposes of this article, I will refer to them all as ALSA. Only a handful of ALSAs have an official logo. However, the logos that do exist vary widely. Why do some law schools have ALSAs? The first ALSA chapter was founded at Southwestern Law School in the 1985-1986 academic year. Former members recall organizing a student-led relief effort to assist the victims of the Spitak Earthquake in December 1988 and working closely with the Armenian Bar Association at its founding in 1989. Below is a yearbook photograph of Southwestern’s ALSA in 1990. 7) meeting eligible Armenian singles looking to make Armenian babies. The ALSAs of each campus reported organizing similar events, like inter-chapter mixers, Armenian food fundraisers, and panels of lawyers and judges. Some organized particularly remarkable events. For example, the Southwestern ALSA of the early 1990s would organize a skiing trip to Big Bear. Another example is UC Hastings’ ALSA, which would organize a special dinner with retired California Supreme Court Justice Marvin Baxter in his private chambers. Nevertheless, every ALSA, regardless of size, past and present, reported organizing some event in commemoration of the Armenian Genocide. Why don’t some law schools have ALSAs? William Saroyan, the Armenian-American author, said of the Armenian people: “For when two of them meet anywhere in the world, see if they will not create a new Armenia.” He’s right! Diasporan Armenians tend to seek each other out, whether they’re in the same city or on the same campus. Once they find each other, they almost invariably begin organizing themselves into a community, Saroyan’s “new Armenia.” However, he was wrong about the number; apparently it takes at least 6 Armenians, not 2. Numbers aren’t the only factor preventing Armenians from founding ALSAs. Interviewees noted that on some campuses Armenians tend to join other student groups that appeal to their ethnic identity, but have a broader focus, like the International Law Society or Middle Eastern Student Association. Others painfully conceded that the Armenian students on their campus show no interest in getting to know one another. 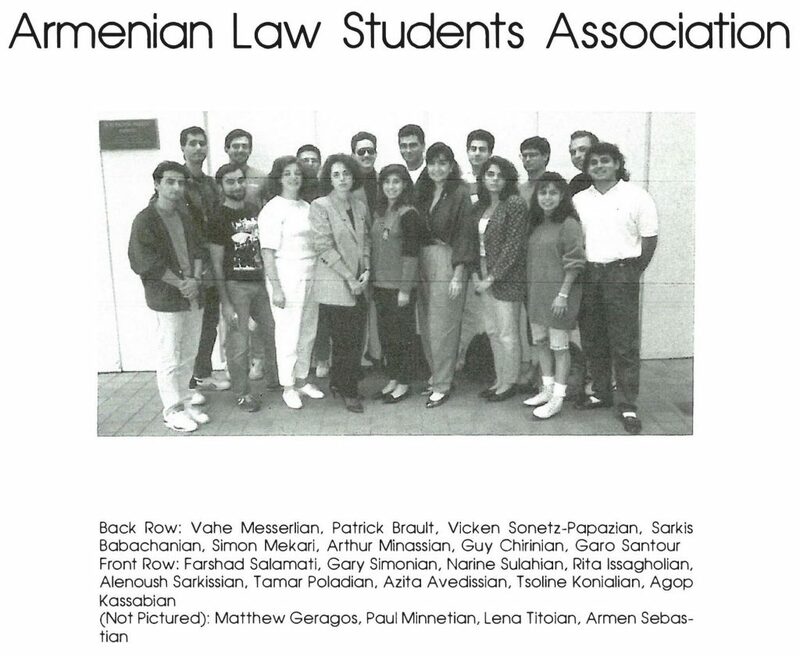 How many Armenians currently attend the 21 ABA-accredited law schools in California? I love asking this question, partly because the responses vary so dramatically. People have estimated as low as 100 Armenian law students and as high as 1,000. After nearly four months of intermittent research and approximately 65 interviews with Armenian law students and alumni, I estimate that the actual number is somewhere between 350-400. Unsurprisingly, about 340 of those students are located in Southern California law schools. Southwestern Law School alone has about 130 Armenian students, the largest Armenian population of any law school in California. Stanford Law School has the fewest, with only 1 Armenian student currently enrolled. Conversations with the different ALSA chapter leaders revealed a pattern of common organizational shortcomings, including a lack of cooperation across campuses, limited support and guidance from the Armenian Bar Association, and problems transitioning from year to year. Regardless, California’s 11 ALSAs continue to thrive. Their numbers have increased, their activities have diversified, and they’re more integrated into the fabric of their respective law school communities. Most importantly, they continue to offer support to those 1-Ls who show up to their first day of class late, sweaty, and pondering the meaning of a Tort. Pepperdine University School of Law 23 YES 2000-2001 ? There were schools for which I couldn’t find any Armenians, but I didn’t want to list them because they may have more than 1 and I just haven’t found them.